Founded by English Quaker William Penn in the 17th century, Pennsylvania is one of the original 13 European colonies settled in the United States. The founding father gives the state its name, which roughly translates from Latin to mean 'Penn's Woods'. Indeed, there are many woods and forests in Pennsylvania, particularly in the Allegheny National Forest in the north. But there is a great deal more besides, with the state spanning more than 300 miles (483km) from Delaware Bay to the Great Lakes. Pennsylvania is perhaps the most historically significant state in the nation, particularly the eastern seaboard city of Pennsylvania. It was here that the Declaration of Independence was signed on July 4, 1776. The Liberty Bell seldom tolls today but still draws millions of visitors annually to the city's Independence National Historic Park. The other main metropolis of Pennsylvania is Pittsburgh on the western side of the state, where the smoke-belching steel mills of the early 20th century have given way to urban redevelopment intended to highlight the region's natural beauty. It receives visitors from all around as it shares borders with six other states, including New York, New Jersey, Delaware, Maryland, West Virginia, and Ohio. 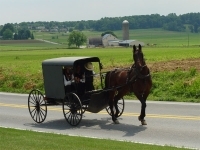 Pennsylvania offers honeymoon retreats, family resorts, ski lodges, an eclectic mix of architecture, historic treasures, panoramic cityscapes, pastoral beauty, artist colonies, and country inns. Whatever travellers want, they will be able to find. Even chocolate lovers will discover paradise here as this is the location of Hershey, home of the world-famous Hershey Bar. It offers up its favourite Chocolate World attraction for tasting and tours. The state capital is the city of Harrisburg in the north, with an exceptionally handsome capitol building, the impressive State Museum covering Pennsylvania's 300-year history, and the National Civil War Museum which focuses on the human side of the conflict.